Many of you wanted to see more of my quilt art. 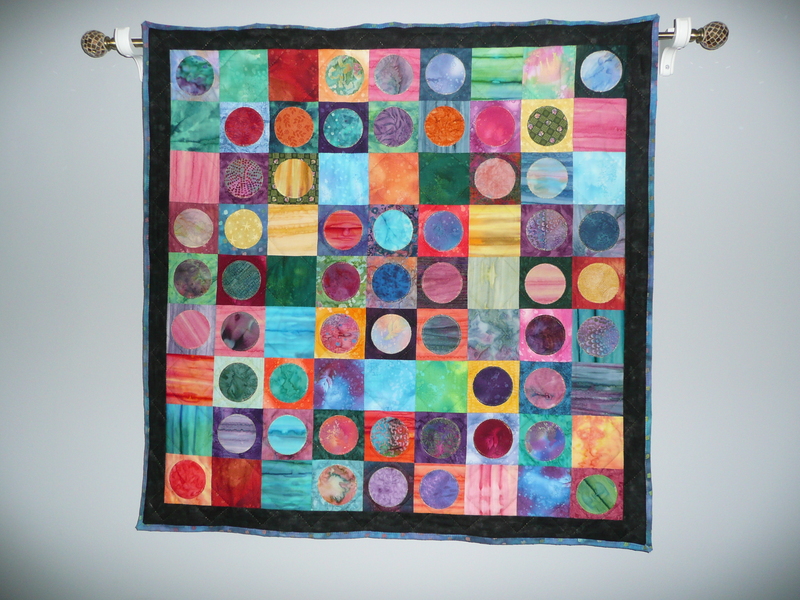 I explored small quilting projects when I retired because large quilts seemed too overwhelming. The freedom of not following a pattern and playing with colors was fun—and I needed some fun in my life. I tried all kinds of projects. I’ve sold a few, but most were given away as gifts or I still have them. Since I started blogging, my Berninas (yes, I have 2) are eerily still and my sewing room is way too neat. I can’t find the time play with my beautiful fabrics while I’m writing. I guess I’m a one-creative-endeavor kinda of a gal. 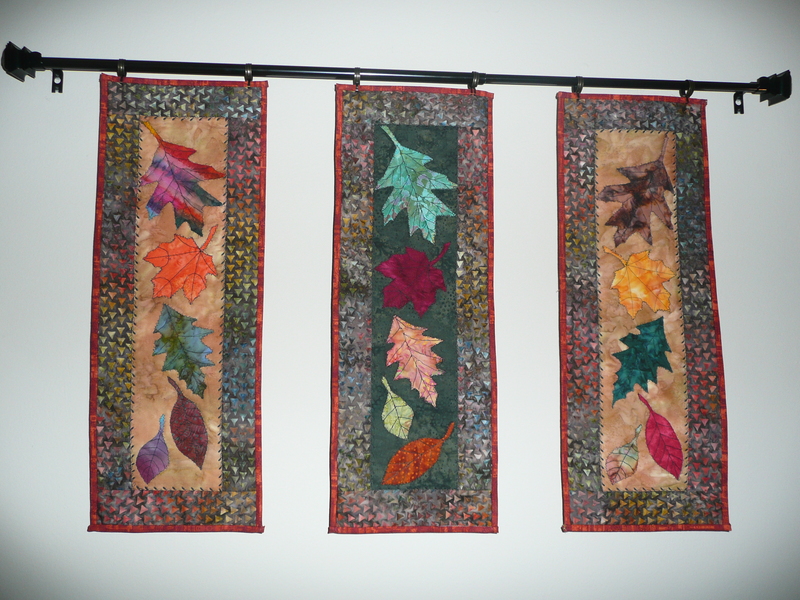 "Breezy Leaves" wall hanging. Batik fabrics, machine appliqued. "Buried Treasure," entirely hand appliqued, pieced, and quilted. This quilt is a tribute to Reggie. I made it while sitting by his cage during his final weeks. One of his yellow crest feathers in tucked behind the label. 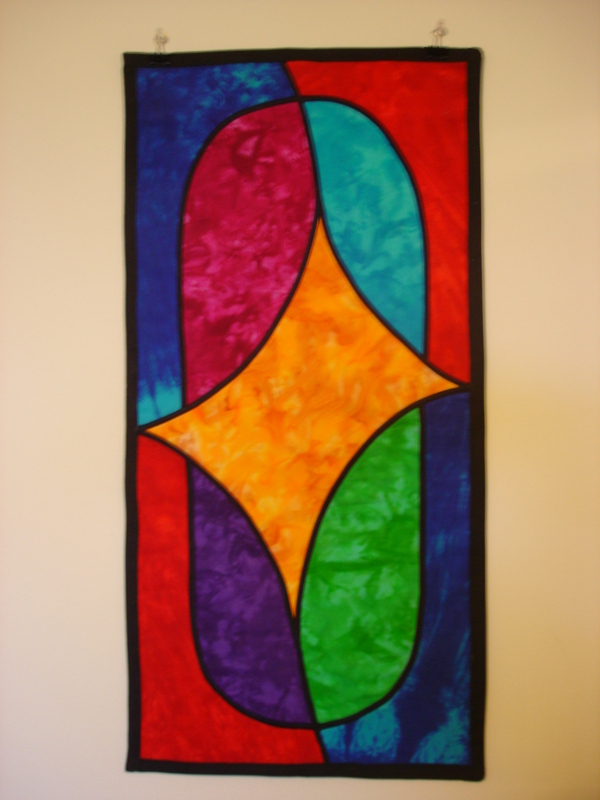 "Chakra Window" a "Stained Glass" style art quilt wall hanging. "Just Picked" 8"X10" fabric, thread "paint" and Shiva oil sticks. 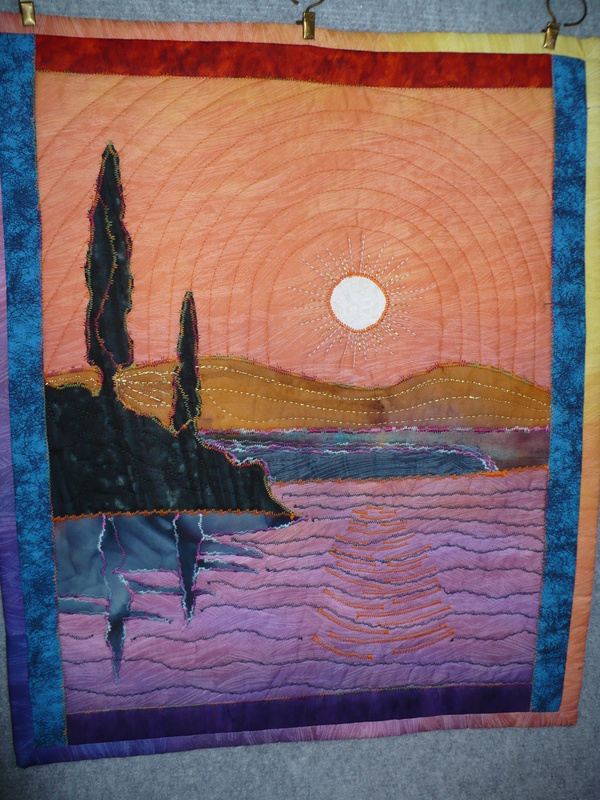 "Lake Champlain Moonshine," wall-hanging with batik fabrics and thread painting. 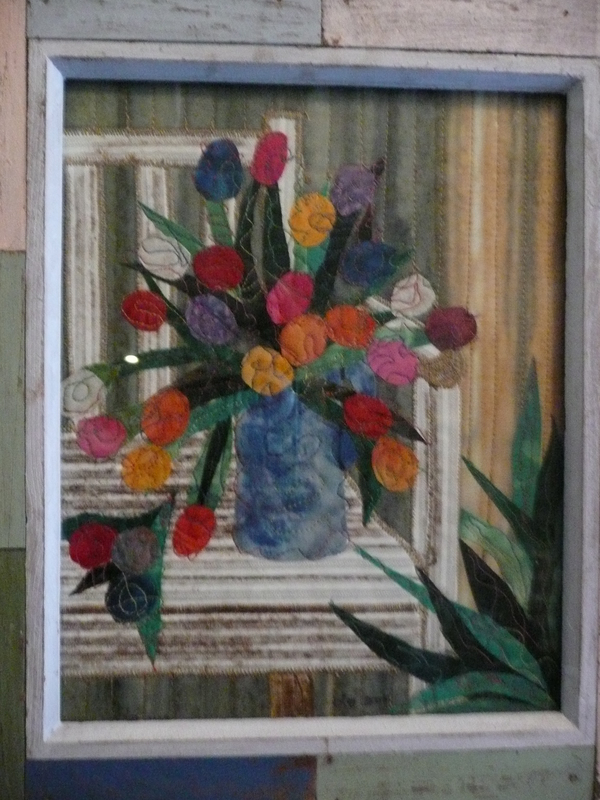 "Fresh Flowers on Old Chair" Machine applique, Shiva oil sticks. 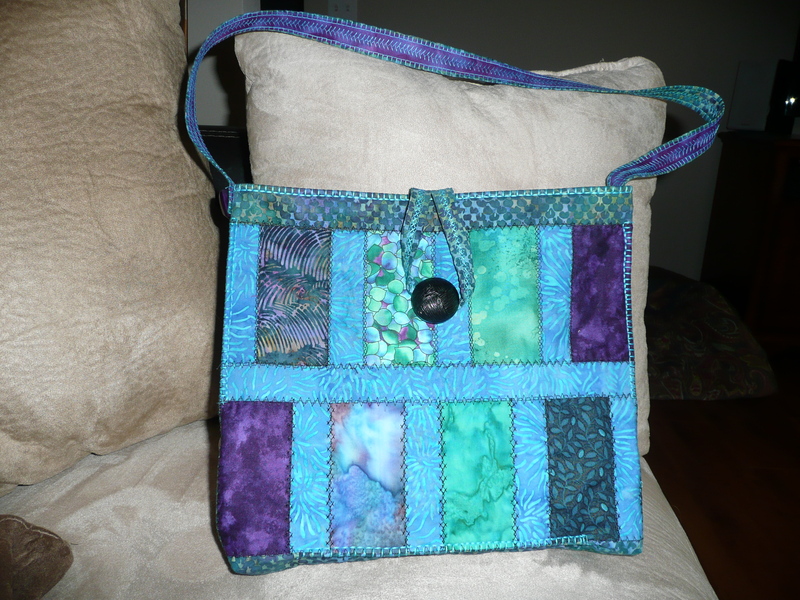 Teal and Purple Handbag, batik fabric and decorative machine stitching. "Remember Me" (or something like that) Hand applique, machine pieced and quilted. 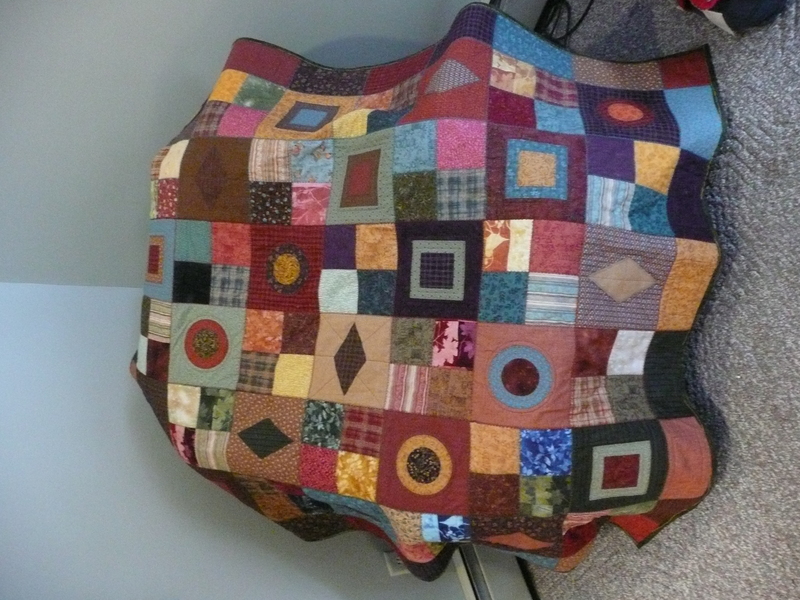 A quilt I made for Chuck, started during the summer of 2009 and finished for Christmas that year. He left me that fall, but I finished it and gave it to him. Machine appliqued handbag. I designed this one after a scarf I love. 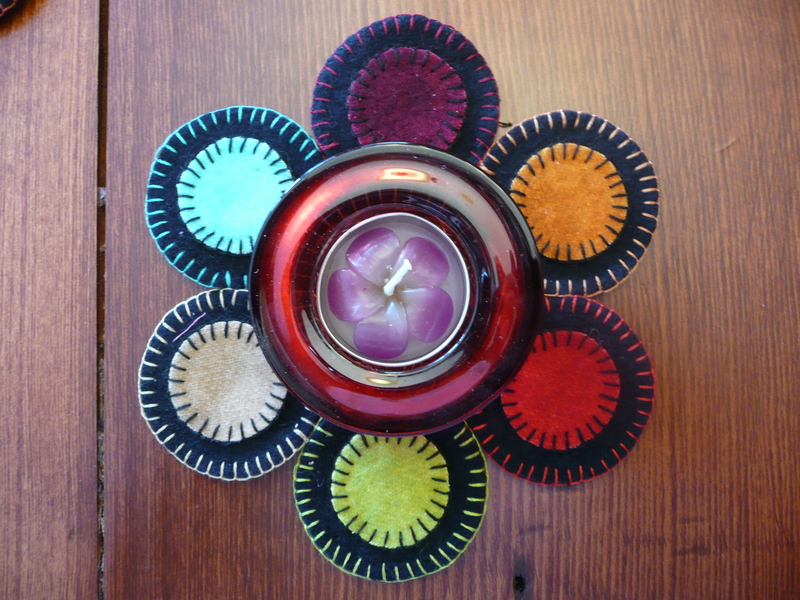 Wool candle mat, hand blanket stitch. Your quilt art is very beautiful! If I was as talented as you, my walls would be full of quilts! Too cool … I think they’re great. As a judge at art shows, I do believe your work would qualify for a ribbon. The Chakra Window stained glass stole my heart. My home is entirely in primary colors – I like to call it a house full of crayola crayons. These are my colors. You are very talented. It must be so relaxing to concentrate on selecting the right fabric in the right color in order to coordinate your lovely quilts. You have a great way of expressing yourself outside of writing. After this month, my days of blogging non-stop will be over. My life story will be told and I’ll blog regularly, but not maniacally. 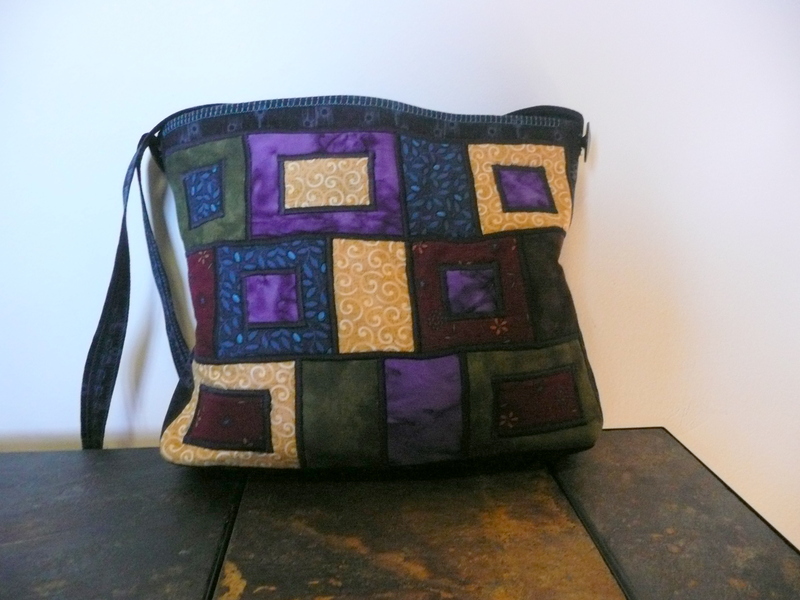 That will give me time to work on fleshing out my book, quilting, and blogging. Since I’m retired, these are my major activities (and volunteering for a few organizations). Thanks, Christine. You know a lot about expressing yourself, too! I love quilts–how they’re made, their history (both as an art form, their role in American life, and the history of a family each contains). The one you made with the bird feather in it is beautiful, but I’m blown away by the Lake Champlain piece! Simply stunning! I am humbled by your incredible fabric art! Stunning beyond words. Thank you so much for sharing. 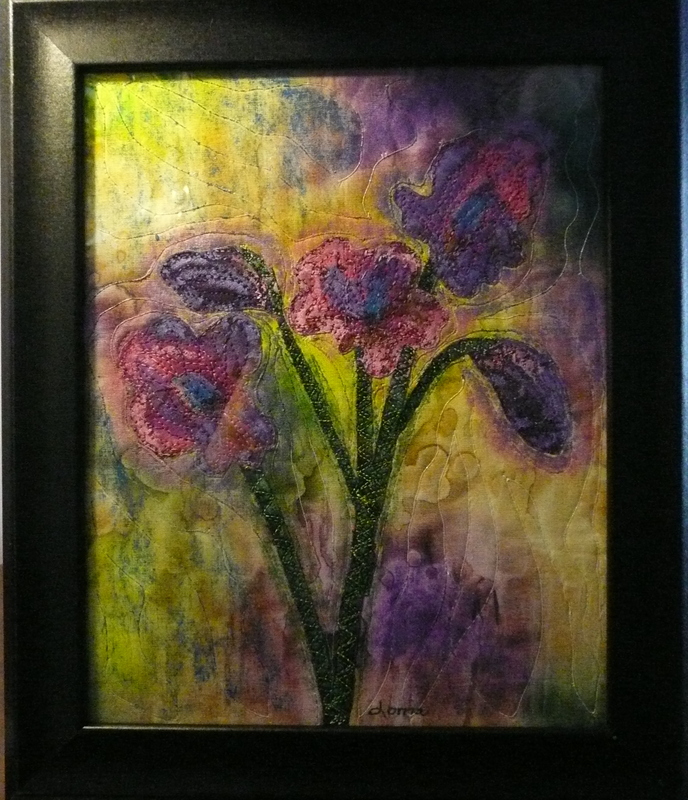 We both need to get back to our quilting/fabric art. These are gorgeous!! Wow! You have so many talents and express yourself in so many ways. Bravo! Beautiful! and they show so many moods. I love how you used the quilt lines to add feeling and depth or motion. The Moonshine one seems a bit like you in your stories, peaceful at first glance, then oh so much more – revealing line by line, and it draws you in. Balancing creative energy — that is a hard one. I like to sew, but I haven’t sewn in probably 3 years. I paint and lately nothing. Let me know if you figure out the key to that balance. 🙂 I would Love to get some myself. The Shiva sticks can add so much character and depth to an art quilt. Once dry and set with heat, they are permanent. They aren’t cheap, but they add that extra something special to your project (they didn’t pay me to say that!). Thank you so much. I love every aspect of creating these pieces. A little but of “me” is in each one. Yes. I feel the need to use whatever part of my brain that is my inner “Material Girl!” I have to write out the rest of my story first, though. By the end of this month, it should be done. Then I can pare back my blogging an find a bit of balance in my life. Thanks so much! 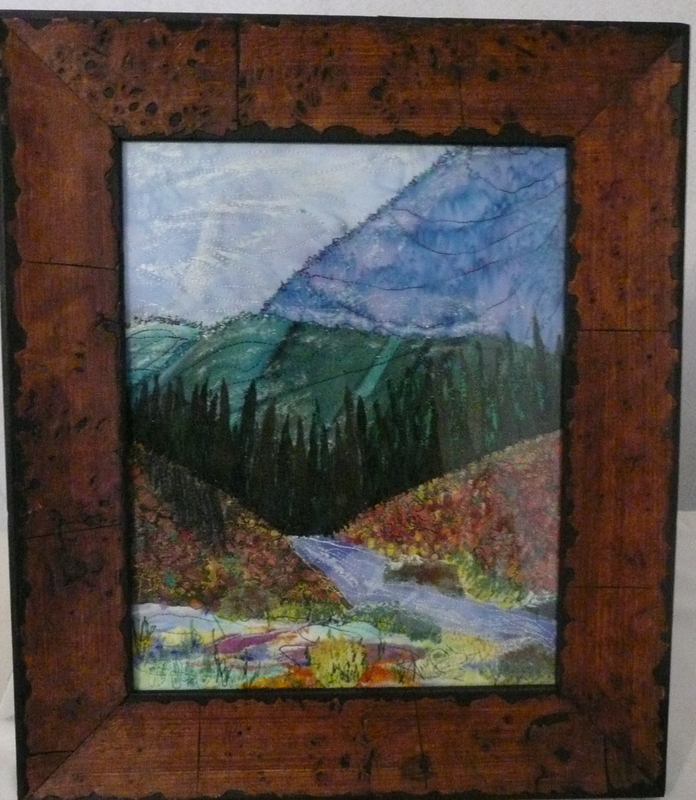 I’m partial to the “landscape” quilts, too. They ARE so different, aren’t they? I guess that suggests I’m not stuck in a rut! Thanks, I found her by following a link from your blog. She does beautiful work! I left her a comment. I was trying to decide which one I liked best and I couldn’t pick one over another. They are all absolutely beautiful. Wow, that’s a lot of really nice artwork! I especially liked “Just Picked” , “Lake Champlain Moonshine” and “Winter Dreams.” But quite frankly, they are all very nice! Beautiful. It would be nice to take a break from writing now and then to work on a small project, don’t you think? I keep a beading project close by, nothing too involved, just something to rest my brain. Oh, Lorna! These are so gorgeous. I had no idea that you were so talented at quilting!! Love them! Thank you for your visit to my blog. 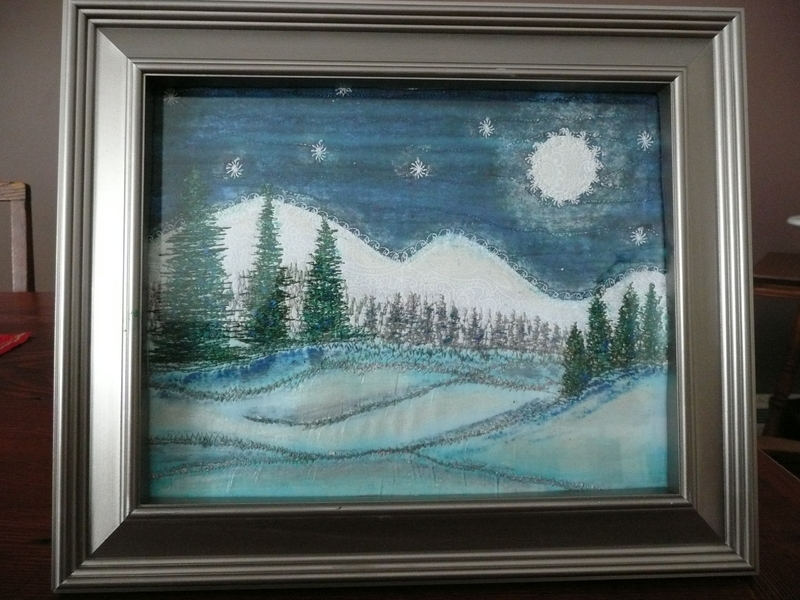 The embroideries are mostly done by my husband, except for a couple of mind in a completely different style. I enjoyed very much my tour through your gallery – such a variety of techniques is very impressive. I mostly do larger projects, but I love making bags of all kinds, and one summer I made and sold about 50 hats and caps. I haven’t come across Shiva sticks – must look out for them. So glad you like my work. I find designing and working on each piece very relaxing. I really need to get back that creative part of me. Thanks, you sweet guy, you! Thanks, and I will try to find Vivinfrance. I always like to see what other quilters are doing. Wow, how talented and creative you are. I like to sew, but no matter how hard I try, I can’t sew (or cut) a straight line. I love them all, especially the winter dreams. I think I’d hang that by my computer monitor and it would be my inspiration. Maybe when we go on book tours together, we can bring some of them to hang behind us and “cozy up” our niche. 😉 Of course they’d probably get more attention than our books! 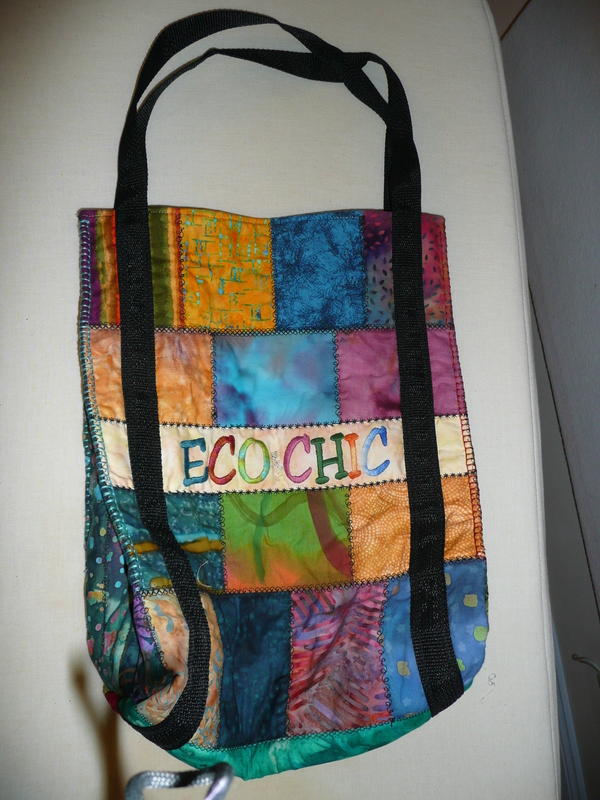 Love your fabric art. How very lovely your work is. I have always wanted to do that kind of thing. I just have to have others to make me sit still long enough to work on things like that. BEAUTIFUL! Do you work on pieces all through the year or is this just an occasional hobby? Those are really nice, Lorna. A lot of time and skill go into quilting, along with patience. Cool!! You talented lady, you.